Named after coastal community of Malibu, California, the Malibu was marketed primarily in North America, with the eighth generation introduced globally. The Malibu SS was replaced in 1966 by a new Chevelle SS-396 series that included a big-block 396 cu in (6.5 L) V8 engine (Canadian market did not receive the SS396 but marketed the former Malibu SS nameplate until January 1967 when it was phased out), heavy duty suspension and other performance equipment. Other SS-396 equipment was similar to Malibu Sport Coupes and convertibles including an all-vinyl bench seat. Bucket seats and console with floor shift were now optional on the SS and for 1966 with the SS now denoting a car with a big-block engine, the bucket seats became a new option on the regular Malibu Sport Coupe and convertible, upon which any six-cylinder or small-block V8 could be ordered. Also new for 1966 was the Chevelle Malibu four-door Sport Sedan hardtop. Styling revisions on all 1966 Chevelles including more rounded styling similar to the full-sized Chevrolets with sail panels and tunneled rear windows featured on two-door hardtop coupes. For 1970, the Malibu was initially the only series of Chevelle offered, aside from the SS-396 and new SS-454, as the low-line 300 and 300 Deluxe models were discontinued for the American market (it continued in Canada until 1972), which also eliminated the two-door pillared coupes from the Chevelle lineup – which were never included in the Malibu series. New grilles, rear decks with taillights moved into the bumper and revised Sport Coupe roofline highlighted this year's changes. The standard six-cylinder engine was punched up from 230 cu in (3.8 L) to 250 cu in (4.1 L) and 155 hp (116 kW; 157 PS), while the same assortment of V8s carried over with the addition of a 330 hp (246 kW; 335 PS), 400 cu in (6.6 L) V8 on non-SS Chevelles. At mid-year, the Malibu was rejoined by lower-line Chevelle models that were simply called the base Chevelle in both four-door sedans and two-door hardtops. The Chevelle was redesigned for the 1973 model year. Models included the base Deluxe, mid-range Malibu & Malibu SS and the top-line Laguna. 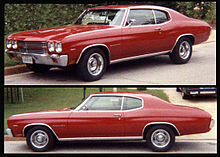 For 1974, the Deluxe was dropped, and the Malibu became the entry-level Chevelle. The Laguna trim package was replaced with the Malibu Classic which used a stacked arrangement of four rectangular headlights and made its way to the dealers in the 1976 model year, offering the Chevrolet built inline six 250 CID as the base engine. The Laguna S-3 model was introduced to replace the SS, and continued through 1976. For the 1978 model year, the Malibu name, which had been the bestselling badge in the lineup, replaced the Chevelle name. This was Chevrolet's second downsized nameplate, following the lead of the 1977 Chevrolet Caprice. The new, more efficient platform was over a foot shorter and had shed 500 to 1,000 pounds (230 to 450 kg) compared to previous versions, yet offered increased trunk space, leg room, and head room. Only two trim levels were offered - Malibu and Malibu Classic. The Malibu Classic Landau series had a two-tone paint job on the upper and lower body sections, and a vinyl top. This generation introduced the Chevrolet 90° V6 family of engines, with the 200 CID (3.3 L) V6 as the base engine for the all new 1978 Chevrolet Malibu, along with the 229 CID (3.8 L) V6 and the 305 CID (5.0 L) Chevy built V8 as options. The 200 and 229 engines were essentially a small block V-8, with one pair of cylinders lopped off. The front and rear bellhousing face were the same as the small V8. The 231 engine was a Buick product, and featured a front distributor. There was no factory Malibu SS option available on this generation. The SS only came in the El Camino. The rare,and striking, 1980 Malibu M80 was a dealer package for only North and South Carolina. It was mostly aimed at NASCAR fans who regularly traveled to Darlington Raceway. To this day, the number actually produced is unknown; estimates place this around 1,901 cars. All M80s had to be white with dark blue bucket seats and center console interior. The base of the M80 was a two-door sport coupe equipped with the F41 Sport Suspension package and the normal V8 (140 hp) drive train. The M80 option added two dark blue skunk stripes on top and a lower door stripe with the M80 identification. The package also added front and rear spoilers and 1981 steel rally wheels (sourced from the 1980 Monte Carlo). In Mexico, General Motors produced this generation in the Ramos Arizpe plant, which was sold during three years (1979 to 1981). 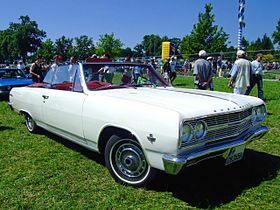 Mexican versions came in three trim levels (Chevelle, Malibu and Malibu Classic) and two body styles (sedan and coupe) with the 250 cu in (4.1 L) I6 as basic engine and the 350 cu in (5.7 L) 260 hp (194 kW) V8 as the optional; this engine was standard on Malibu Classic models during those three years. This was possible because the Mexican emissions regulations remained relatively free at the time. In 1981, General Motors of Canada in Oshawa produced a special order of 25,500 four-door Malibu sedans for Saddam Hussein's Iraqi government. The deal was reportedly worth well over $100 million to GMCL. These special-order Malibus carried the unusual combination of GM's lowest-power carburated V6, the 110 hp (82 kW) 229 cu in (3.8 L) engine mated to three-speed manual transmission with a unique on-the-floor stick shifter. All of the cars were equipped with air conditioning, heavy duty cooling systems, AM/FM cassette decks, front bench seats, 200 km/h speedometers, tough tweed and vinyl upholstery and 14-inch (360 mm) body-color stamped steel wheels with small "dog dish" hubcaps. However, only 13,000 units ever made it to Iraq, with the majority of the cars becoming taxis in Baghdad (once the cab-identifying orange paint was added to the front and rear fenders). With the remaining balance of about 12,500 additional Malibus either sitting on a dock in Halifax or awaiting port shipment in Oshawa, where they were built, the Iraqis suddenly cancelled the order in 1982. Excuses reportedly included various "quality concerns", including the inability of the local drivers to shift the finicky Saginaw manual transmission. This issue was eventually identified as being due to an apparent clutch release issue that eventually required on-site retrofitting by a crew of Canadian technicians sent to Iraq to support the infamous "Recall in the Desert". Later speculation was that the Iraqis were actually forced to back out for financial reasons, due to their escalating hostilities with Iran requiring the immediate diversion of funds to support the Iraqi war effort. Then GM of Canada President Donald Hackworth was initially quoted as stating GMCL intended to still try to sell the Malibus overseas in other Middle East markets; however in the end, the orphaned "Iraqi Taxi" Malibus were all sold to the Canadian public at the greatly reduced price of about C$6,800. Over the years, they have acquired a low-key 'celebrity' status, sometimes being colloquially referred to as "Iraqibu". The Malibu was an extensively used body style in NASCAR competition from 1973 to 1983. The Laguna S-3 variant, in particular, was successful during the 1975 through 1977 racing seasons, with Cale Yarborough wining 20 races in those years as well as winning the NASCAR championship one year. Because it was considered a limited edition model, NASCAR declared it ineligible for competition following the 1977 season, even though (given NASCARs three-year eligibility rule) it should have been allowed to run through 1979. Beginning in 1981, the downsized Malibu body style was eligible to run, but given its boxy shape, only one driver Dave Marcis ran it in 1981 and 1982, with one victory in a rain-shortened Richmond 400 at Richmond in 1982, the independent driver's last win. The base 200 cu in (3.3 L) V-6 engine for the 1978 Chevrolet Malibu developed just 95 hp (71 kW; 96 PS) with optional upgrade to a 105 hp (78 kW; 106 PS) V-6, or 145 hp (108 kW; 147 PS) V-8. The largest and most powerful option was the 165–170 hp (123–127 kW) 350 cu in (5.7 L) V-8. Beginning in 1982, the Malibu shared GM's redesignated rear-wheel-drive G platform with cars like the Pontiac Grand Prix, Oldsmobile Cutlass Supreme and Buick Regal. The Malibu Classic was last marketed in 1982; Malibus were produced as four-door sedans and as station wagons until 1983, at which time it was fully replaced by the front-wheel-drive Chevrolet Celebrity. Although the sedan and wagon were phased out, the El Camino utility, which shared styling with the Malibu, remained in production until 1987. A new front-wheel drive Malibu was introduced for the 1997 model year on an extended wheelbase version of the GM N platform shared with the Buick Skylark, Oldsmobile Achieva, Oldsmobile Alero, and Pontiac Grand Am as a competitor to the perennial stalwarts the Honda Accord and Toyota Camry which were the best sellers in the midsize market. GM phased out the L platform Corsica/Beretta where a new midsize was introduced in the wake of GM phasing out its B platform (at this time the Chevrolet Lumina was the largest car). All N-body Malibus were produced at the Oklahoma City Assembly plant (after 2002 it was retooled to build the GMT360 SUVs) and the Wilmington Assembly plant (1997 to 1999), before moving production to Lansing, Michigan. The Wilmington plant was retooled to build the Saturn L-Series in 1999. The Oldsmobile Cutlass was a rebadged, slightly more upscale version of the Malibu, produced from October 1996 – 1999. It was intended as a placeholder model to fill the gap left by the discontinuation of the aging Oldsmobile Cutlass Ciera, before the all-new Alero arrived in 1999. The Malibu itself replaced the compact Chevrolet Corsica. Power came from a 2.4 L 150 hp (112 kW) I4 or 3.1 L 155 hp (116 kW) V6. The Malibu was Motor Trend magazine's Car of the Year for 1997; this was later criticized by Car and Driver in 2009, citing that the Malibu was insufficiently distinguishable in terms of performance or interior quality to warrant such praise in hindsight. Standard features included four-wheel ABS brakes, hydraulic engine mounts and air conditioning. The 1997 to 1999 Malibus had a front grille with the Malibu logo in silver in the center; 2000 to 2003 models, and the Classic, had the blue Chevrolet emblem on the front grille. The 1997 to 2003 LS models were sometimes equipped with special gold-colored badges (the rear Malibu lettering and logo). The 3.1 L V6 was updated in 2000 with a new power rating of 170 hp (127 kW), and the 2.4 L 4-cylinder was dropped after that year. However, a 4-cylinder was reintroduced in 2004 when the 2.2 L Ecotec was offered on the Classic. U.S. Environmental Protection Agency fuel mileage estimates for the 2.2 L Ecotec engine are 21 mpg‑US (11 L/100 km; 25 mpg‑imp)-31 mpg‑US (7.6 L/100 km; 37 mpg‑imp). The February 2002 issue of HCI: Hot Compact & Imports magazine featured the Chevrolet Malibu Cruiser concept that GM Performance Division built for the SEMA show in 2001. The car was painted in "Sublime Lime" by BASF and featured a highly modified turbocharged 3500 SFI 60-degree V6 (producing 230 hp (170 kW) at 5,000 rpm and 280 lb⋅ft (380 N⋅m) of torque at 2,900 rpm), a 4T65-E four-speed transmission with overdrive, a set of 19x8-inch wheels by Evo wrapped in Toyo Proxes T1-S high-performance tires. Numerous interior modifications included a full-length custom center console, four black leather Sparco racing seats, and a Kenwood entertainment center (with radio, CD, DVD, TV, 10-disc changer and numerous amps and speakers). Exterior modifications included custom HID headlamps (both low and high beams), "Altezza" style taillights, and a custom bodykit. Chevrolet produced the Cruiser as a concept, and it was therefore never available for purchase. Their intent was to attract younger buyers to the stock model and demonstrate that aftermarket modifications could be made. The Malibu name was moved to GM's new Epsilon platform based on the 2002 Opel Vectra C for 2004. The Epsilon-based Malibu came in two bodystyles, a standard 4-door sedan and a 5-door Malibu Maxx hatchback (the first mid-size Chevrolet hatchback since the 1989 Chevrolet Corsica). The Malibu Maxx has a fixed glass roof panel over the rear seats with a retractable sunshade, and an optional glass panel sunroof over the front seats and was similar in execution to the Opel Signum, a large hatchback derived from the Vectra C.
Base power for the sedan came from a 2.2 L Ecotec L61 I4 producing 144 hp (108 kW). LS and LT trim sedans and Maxx models originally came with a 3.5 L 201 hp (149 kW) High Value LX9 V6. The SS sedan and Maxx models were powered by the 3.9 L 240 hp (179 kW) High Value LZ9 V6. For 2007, the LX9 was replaced with the LZ4 V6, which in the Malibu produced 217 hp (162 kW). The L61 Ecotec was also updated for the 2007 model year with many improvements. A remote starter was also available, which was introduced on several other GM vehicles for 2004. 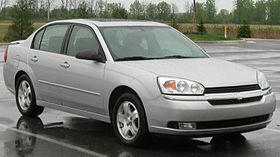 While the Malibu Maxx was discontinued after the 2007 model year, the Malibu sedan remained in production for the 2008 model year, known as the Malibu Classic. The cars themselves bear Malibu badges, unlike the past generation Classic. A special SS trim was available on the Malibu and Malibu Maxx with the 3.9 L LZ9 V6 from 2006 to 2007, developing 240 hp (179 kW) and 240 lb⋅ft (325 N⋅m) and channeled through a 4T65-E four-speed automatic with Tap-Up/Tap-Down shifting, sport suspension with tower-to-tower brace, 18" alloy wheels, universal home remote transmitter, rear spoiler and hydraulic power steering. Changes to differentiate the SS from the lower trims include three-spoke, leather wrapped steering wheel with SS badge, sport cloth and leather seats, side skirts, chrome tip exhausts, and more aggressive front and rear clips. The Malibu was redesigned for the 2008 model year by Bryan Nesbitt, under the direction of GM Vice Chairman Robert Lutz—who was determined to make the nameplate competitive with Japanese mid-size cars. Extensive engineering and design went into the remodel. This generation of Malibu came in many trim levels: the Base (2008 only) (1SB), the LS 1LS (or 1FL for fleet models 2011 and 2012), the LT 1LT (or 2FL for fleet models 2011 and 2012), the Hybrid (2008 and 2009 only), and the LTZ 1LZ. Only the top level LTZ trim package was fitted with clear brake light lenses with red LED lights, the balance of trim packages retaining red lenses with conventional brake light bulbs. The seventh generation Malibu is built on a revised version of the long-wheelbase Epsilon platform shared with the Saturn Aura, the Opel Signum, and Pontiac G6. It is assembled in Kansas City, Kansas. Overall, it is three inches (76 mm) longer, with a six inches (152 mm) longer wheelbase. Interior room remains mid-size, like the previous Malibus, and has been decreased from 101 cubic feet (2.9 m3) to 97.7 cubic feet (2.8 m3), despite having a longer wheelbase, although front legroom has increased from 41.9 in (1,064 mm) to 42.2 in (1,072 mm). Rear legroom has decreased from 38.5 in (978 mm) to 37.6 in (955 mm). The interior design was revised, with a selection of two-tone color combinations (brick and tan two-tone), telescoping steering wheel, higher-quality materials and a twin-cowl dash design. Drag (Cd) is at 0.33. The 2.4 L I4 and 3.6 L V6 engine have aluminum blocks and heads, dual overhead cams, four valves per cylinder, twin balance shafts, and variable valve timing. The 3.5 L V6 has aluminum heads, an iron block, overhead valves, and limited variable valve timing. The 3.5 L V6 was offered as an upgrade for special-order fleet vehicles, to replace the Ecotec engine, and generally was not available for retail customers. The 3.5 L V6 was not available in the LTZ. The 3.5 L V6 with four-speed transmission has been the only drivetrain available in the 2008, 2009, and 2010 models in Israel. Partway through the 2008 model year, the 2.4 L Ecotec was offered with a six-speed automatic transmission to improve performance and fuel economy. For 2009 models, the six-speed transmission mated to the 2.4 L 4-cylinder engine or the 217 horsepower 3.5 L V6 mated to the four-speed automatic were made available on the 1LT; the six-speed became standard on 2LT models the same year. The LS models were equipped with the four-speed transmission only. A manual transmission was not offered. All models are front-wheel-drive sedans. Chevrolet dropped the Malibu MAXX station wagon model. Partway through the 2010 model year, the GM badges were removed from the front doors. OnStar was included on all Malibu models as standard equipment (excluding fleet vehicles, where this feature is optional). Six air bags were also standard on the seventh generation Malibu; two dual-stage front bags, two side-impact curtain air bags protecting the heads of both front and rear passengers, and two side-impact thorax bags mounted in the front seats. Traction control, electronic tire pressure monitoring system, four-wheel disc brakes, antilock brakes, and daytime running lamps were standard included safety features on all Malibus. GM's StabiliTrak brand electronic stability control was standard on all models including the very base LS model. In 2011, the base LS 1LS Malibu gained more standard features, like Bluetooth technology with stereo audio playback capability, a remote USB and iPod/iPhone port, remote start, a security alarm, an upgraded OnStar system, power front driver's seat, chrome hubcap wheel covers, body-colored side mirrors with power adjustments and body-colored accents, a single wood dashboard accent, tinted windows, and a six-speed automatic transmission with overdrive and manual shift capabilities. The LT 1LT model lost its available eight-speaker Bose premium sound system. The LT 2LT got a package that included a sunroof, leather power heated seats, and more convenience and comfort features. For 2011, the four-speed automatic transmission was dropped from the Malibu powertrain lineup. This same model year also saw the deletion of the steering wheel mounted paddle shifters on 6AT cars in favor of a selector mounted rocker switch for manual operation; no reason was ever given for the change. A BAS mild hybrid, with the base inline-4 like the Saturn Aura Green Line, was available offering an increased fuel economy of 24 mpg‑US (9.8 L/100 km; 29 mpg‑imp)/32 mpg‑US (7.4 L/100 km; 38 mpg‑imp), which for the 2009 model was increased to 26 mpg‑US (9.0 L/100 km; 31 mpg‑imp)/34 mpg‑US (6.9 L/100 km; 41 mpg‑imp). The Malibu hybrid was dropped for the 2010 model year. The 2008 Malibu received critical praise from the automotive press, with The New York Times referring to it as being "like a super Accord, but from GM" and Car and Driver magazine declaring, "Camry, Beware." It also garnered high praise from Motor Trend magazine, being rated higher than the Honda Accord and Nissan Altima in the magazine's 2008 Car of The Year competition. Kelley Blue Book named it the "2008 best redesigned vehicle". Car and Driver stated that while it would not be "enough to steal the top-dog sales title from the perennial Honda and Toyota mid-sizers", they noted "for the first time since Chevrolet revived the storied nameplate in 1997, it has enough of what it needs to sell in significant numbers to the public, not just rental fleets". 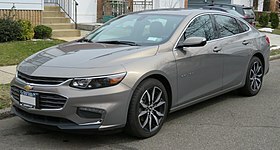 Edmunds.com praised the Malibu's interior and exterior styling, quietness, and balance between ride and handling, while criticizing the thick C-pillars that obstruct the driver's view, the narrower chassis compared to other midsize cars (which reduces rear seating room and also lacks a center armrest) and lack of features such as dual-zone HVAC, Bluetooth compatibility, and keyless ignition. While Robert Cumberford, design critic at Automobile magazine noted the interior of the platform-variant, the Saturn Aura featured cheap interior materials, he noted improved in the Malibu. Writers of various reviews[who?] for the 2008 Malibu believed Chevrolet would be getting back on track in quality and excitement in the mid-size segment after a history of ordinary, bland offerings, such as the Celebrity, Corsica, Lumina, and even the previous two generations of Malibu since its 1997 revival. 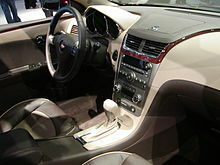 In January 2008, the redesigned Malibu received the North American Car of the Year award at the North American International Auto Show in Detroit in voting among a panel of 50 automotive journalists in a field of entries, with the runners up being the 2008 Cadillac CTS and the 2008 Honda Accord. The Malibu's win marked the second straight year a car built on GM's Epsilon platform won the North American COTY award with the 2007 North American COTY award having gone to the 2007 Saturn Aura. Initial sales results were positive, with the Malibu joining the Cadillac CTS and Buick Enclave on a list of GM vehicles whose sales have exceeded expectations. The redesigned Malibu sold more than 50% more units in 2008 than in 2007, increasing GM's mid-size market share to 8.4% from 5.7%, while the Camry and Accord percentages remained flat at about 21% and 17.5%, according to GM. Sales to rental customers dropped to 27% of the total, as GM limited sales to rental fleets. The short-lived Malibu Hybrid, along with its sister, the Saturn Aura Green Line, which share the powertrain and other major components, was particularly criticized due to its lack of fuel savings and cost (relative to a standard 4-cylinder Malibu), plus the Hybrid's worsened driving dynamics. On September 21, 2012. General Motors recalled 473,841 vehicles involving the Chevrolet Malibu, Pontiac G6 and Saturn Aura from model years 2007 through 2010 equipped with four-speed automatic transmissions. The problem is a condition that could make cars roll when in park. The recall affected 426,240 in the United States, 40,029 in Canada and 7,572 in other markets. The eighth generation Malibu was offered with four-cylinder engines and six-speed automatic transmissions. The European version is offered with a 2.4 L Ecotec engine, which uses an aluminum block and cylinder head and a 2.0 L Diesel (1,956 cc) VCDi developing 160 PS (120 kW) (this was the only engine available in Italy). The Middle-East version was offered with the 2.4 L Ecotec engine. Also available was a 3.0 L V6 engine making 260 hp and 290NM, available on LTZ trim. The Australian market had two versions on offer: CD (2.4 L Otto) and CDX (2.0 L Diesel) The North American version was offered in 2.5L. Standard safety features on the eighth generation Malibu include dual-stage front airbags for the driver and front passenger, along with pelvic/thorax side-impact and knee airbags up front also. Roof rail airbags with rollover protection are standard. Also available as option extras are second-row head/thorax side-impact airbags, lane departure warning system with forward collision alert and a rearview camera system. The eighth generation Malibu was sold in "nearly 100 countries on six continents". In the United States, it is manufactured in two plants, Fairfax, KS and Detroit-Hamtramck. In Australia and New Zealand, the Malibu replaced the Holden Epica, and made its debut in 2013 as the Holden Malibu. It was positioned between the Holden Cruze and Holden Commodore. In South Korea, the Malibu replaces the Daewoo Tosca, as GM has phased-out the Daewoo brand in favor of Chevrolet. Korea was the first market to get the Malibu, in late 2011, followed by China later in 2011 and North America beginning in early 2012. The Malibu made its Middle Eastern debut in 2012 replacing the Holden VE Commodore based Lumina. In Europe, the Malibu replaced the Chevrolet Epica. The facelifted Malibu was never sold in Europe. In North America, the eighth generation Malibu continued to be sold in 2016 as the Malibu Limited as the next generation went on sale. It was mostly identical to the 2015 model, but only featured the 2013 I4 engine variant (LCV instead of LKW) with auto stop-start. In China, the eighth generation Malibu continues in production alongside the ninth generation Malibu. It received a facelift in 2016 to match the current Chevy design language. A 1.5-liter turbo engine was added for the model year 2017 onwards. In a March 2012 comparison test by Car and Driver, the “light electrification" Chevrolet Malibu Eco hybrid came in sixth place out of six cars. It should be noted that the Eco is not a Malibu LS, LT, or LTZ. The Malibu Eco was criticized for its reduced wheelbase, causing a 0.8" reduction in legroom for back seat passengers. The interior was also criticized for being disappointing and cramped. The ride, however, was said to be smooth and quiet, with the only problem being the stiff steering. Eighteen months after the 2013 Malibu's debut, it received a mild refresh. The changes included additional technology, improved fuel economy, and a sportier front end that more closely matched the refreshed Chevrolet Traverse and the newly redesigned Chevrolet Impala. Chevrolet also made some minor changes to the center console to deliver a longer, ostensibly more comfortable armrest, and replaced the former covered storage area with a pair of cup holders and two cell-phone bins. The Chinese model received a refreshed front end with revised headlights. Among the technology that Chevrolet debuted on the 2014 Malibu was a new six-speed transmission. Because the transmission was designed to reduce the energy required to pump transmission fluid, it contributed to fuel savings on the refreshed Malibu. In addition, for the first time in a non-hybrid GM vehicle, an engine stop/start system came standard with the 2.5 L engine. EPA fuel-economy estimates showed an improvement to 25/36 mpg city/highway, up from the 2013 model's 22/34 for the base 2.5 L engine. The 2014 Malibu was available for purchase in late 2013. On April 1, 2015, Chevrolet unveiled a redesigned Malibu at the 2015 New York Auto Show, which went on sale in late 2015 as a 2016 model. The updated Malibu featured a sleeker, yet larger design similar to its full sized Impala. The wheelbase was increased almost four inches, creating more interior space; but the fuel efficiency is improved, as it is nearly 300 pounds lighter than the eighth generation model. The 2016 Malibu was offered in four trims: L, LS, LT, and Premier (replacing the LTZ trim). The Malibu features an all-new, LFV Ecotec 1.5L turbo that is standard, while a 2.0 L turbocharged engine is offered as an optional feature. No six-cylinders are offered from now. Other new features on the ninth-generation Malibu that were introduced for the 2016 model year include available OnStar 4G LTE in-vehicle connectivity, as well as available wireless phone charging, preventive safety technologies including ten standard air bags featuring forward collision avoidance system rear cross traffic alerts, and an optional automatic parking assist. It features Forward Collision Alert with Following Distance Indicator, Adaptive Cruise Control with Front Automatic Braking, and Front Pedestrian Alert with last-second automatic braking. It is also installed with start-stop ignition once the engine is at operating temperature and the brake is applied while the vehicle is stopped. The 2016 Malibu features a first for the automotive industry, a teen driver feature, which allows parents to view their kids' driving statistics, such as maximum speed, warning alerts and more. To operate the vehicle a parent enables the feature with a PIN in the settings menu of the Malibu's MyLink system, which allows them to register their teen's key fob. The system's settings are turned on only to registered key fobs. This technology also mutes the radio until the seat belts are buckled. The 2016 Malibu comes equipped with both Apple CarPlay and Android Auto Capability features. However, only one of their phone brands at any one time can be used. The ninth generation Malibu offers a full hybrid model for the first time, featuring a 1.8 L four-cylinder engine mated to a two-motor drive unit and electronically-controlled, continuously-variable automatic transaxle, providing additional power to assist the engine during acceleration for 182 horsepower of total system power. An Exhaust Gas Heat Recovery system allows the engine and cabin to warm up during winter conditions, while an 80-cell, 1.5 kWh lithium-ion battery pack provides electric power to the hybrid system, powering the Malibu Hybrid up to 55 mph (89 km/h) on electricity alone, while the gasoline-powered engine automatically comes on at higher speeds and loads to provide additional power. The Malibu Hybrid uses a transmission ("two motor drive unit" in GM terms) similar to the second generation Chevrolet Volt, but a much smaller battery, no plug-in option and a different engine. The following table compares the fuel economy for all variants of the 2016 model year Malibu. ^ Based on 45% highway and 55% city driving. Values rounded to the nearest US$50. Gasoline cost of US$2.24 per gallon as of 6 May 2016[update]. Chevrolet updated the Malibu in 2018 for the 2019 model year. A new larger front grille, split by a chrome bar with the Chevrolet bow-tie, dominates the front, while the rear change is less significant. The Premier trim adds LED headlamps while the L/LS/RS/LT/Hybrid trims maintain halogen headlamps. A new RS trim-line is added for a sportier appearance, with a black grille, unique 18-inch wheels, and dual exhaust. The touchscreen is replaced with the 8-inch Chevrolet Infotainment 3 in the L/LS/RS/LT trims and Chevrolet Infortainment 3 Plus with HD screen in the Hybrid and Premier trims. Heated Second Row Seats are added to the Premier trim. The standard 1.5 L engine is now paired with a CVT instead of the 6-speed automatic transmission. Safety features were also improved for the 2019 Malibu including Low Speed Forward Automatic Braking, IntelliBeam high-beam assist headlamps and an semi-automated parking system. ^ "How Stuff Works 1978 Chevrolet Malibu". How Stuff Works. ^ Reuters (March 30, 1982). "G.M. Canada Files Insurance Claim". New York Times. Retrieved April 23, 2009. ^ Demere, Mac. "1997 Oldsmobile Cutlass GLS - Sneak Peek". Motor Trend. Retrieved March 16, 2013. ^ "Dishonorable Mention: The 10 Most Embarrassing Award Winners in Automotive History- Yahoo! Autos Article Page". Autos.yahoo.com. Retrieved April 23, 2009. ^ 1997 Chevrolet Malibu. General Motors. 1997. ^ "Chevrolet Malibu Cruiser Concept". supercars.net. Retrieved September 24, 2009. ^ "Chevrolet Malibu Cruiser — 2001 SEMA Auto Show". edmunds.com. Retrieved September 24, 2009. ^ "Chevrolet Malibu Maxx Review". Edmunds.com. Retrieved April 23, 2009. ^ "2005 Chevrolet Malibu Maxx - Test drive and new car review - 2005 Chevrolet Malibu Maxx". Cars.about.com. April 1, 2008. Archived from the original on April 9, 2009. Retrieved April 23, 2009. ^ a b "2006 Chevrolet Malibu Specs". JB car pages. ^ "2006 Chevrolet Malibu Review". JB car pages. ^ "51st New England International Auto Show". Providence Journal, Projo Cars, C.T. Ellsworth. December 1, 2007. ^ a b Helliker, Kevin (April 1, 2009). "Malibu Shows Road to Revival Is Bumpy". The Wall Street Journal. Retrieved April 23, 2009. ^ "2008 Chevrolet Malibu Specs". JB car pages. ^ "2008 Chevrolet Malibu Specs". CarGurus. ^ a b "2008 Chevrolet Malibu Review". JB car pages. ^ "2008 Chevrolet Malibu - Auto Shows". Car and Driver. Retrieved July 4, 2010. ^ "GM to drop corporate logo from vehicles". The Detroit News. Retrieved September 30, 2010. ^ "2011 Chevrolet Malibu loses four-speed automatic". Leftlanenews. Retrieved July 28, 2010. ^ a b Ulrich, Lawrence (June 21, 2009). "A G.M. Hybrid That Misses the High Notes". The New York Times. Retrieved April 28, 2010. ^ "Kelley Blue Book's Kbb.Com Names Chevrolet Malibu '2008 Best Redesigned Vehicle'". KBB. ^ "2008 Chevrolet Malibu LT - Short Take Road Test - Engine Choices". Car and Driver. March 23, 2008. Retrieved April 23, 2009. ^ Karesh, Michael (November 9, 2007). "Chevrolet Malibu Review". The Truth About Cars. Retrieved October 26, 2009. ^ "Comparison Test: 2007-2008 V6 Family Sedans". Edmunds.com. December 9, 2007. Archived from the original on June 15, 2009. Retrieved April 23, 2009. ^ Peter Valdes-Dapena, CNNMoney.com staff writer (October 10, 2006). "Saturn Aura aims high, scores big. CNN Money". Money.cnn.com. Retrieved January 4, 2011. ^ "GM Reports 323,453 December Deliveries". GM. Archived from the original on December 19, 2008. ^ "2010 Ford Fusion Hybrid vs. Camry Hybrid, Altima Hybrid, and Malibu Hybrid - Comparison Tests". Caranddriver.com. Archived from the original on July 29, 2010. Retrieved April 9, 2011. ^ Klayman, Ben (September 21, 2012). "GM recalls nearly 474,000 cars over gear shift problem". Reuters. Retrieved September 21, 2012. ^ "Chevrolet Malibu recalls". Carsdesk. ^ "2013 Chevrolet Malibu specifications". General Motors. Retrieved July 17, 2012. ^ a b "Print Book". Gmfleetorderguide.com. Retrieved March 12, 2016. ^ "Chevrolet Launches Malibu in Uzbekistan". Media.gm.com. March 20, 2012. Retrieved October 29, 2013. ^ "2012 Chevy Malibu Revealed in Patent Drawings? : Auto News". Autoguide.com. March 11, 2010. Retrieved April 7, 2010. ^ Sutcliffe, Ashley (April 1, 2011). "Chevrolet China: Chevrolet Malibu teaser revealed, to be known as Mai Rui Bao in China". chinacartimes.com. China Car Times - China Auto News. Archived from the original on April 5, 2011. Retrieved October 2, 2012. ^ "All-New Chevrolet Malibu Set for Global Premiere" (Press release). General Motors. March 31, 2011. Retrieved May 9, 2011. ^ "Spied: First images of 2012 Chevrolet Malibu". Leftlanenews.com. March 26, 2010. Retrieved April 7, 2010. ^ "Malibu". Media.chevroleteurope.com. April 19, 2011. Archived from the original on January 19, 2013. Retrieved October 29, 2013. ^ "All-New 2013 Chevrolet Malibu Arrives to the Middle East". Media.chevroletarabia.com. March 22, 2012. Retrieved October 29, 2013. ^ "Malibu Escape | Holden Malibu 2013 Australia". Holden.com.au. June 16, 2013. Archived from the original on November 6, 2013. Retrieved October 29, 2013. ^ The Motor Report, Holden Malibu Shown as 2012 Chevrolet Malibu. ^ "All-New 2013 Chevrolet Malibu Gives Customers More". General Motors. April 18, 2011. Retrieved April 22, 2011. ^ The Motor Report, Holden Malibu teased ahead of 2012 launch. ^ "Chevrolet Malibu Expands Global Reach". General Motors. April 29, 2011. Retrieved May 9, 2011. ^ "2016 Chevrolet Malibu Limited Sedan Review". Edmunds. Retrieved January 22, 2016. ^ "2013 Chevrolet Malibu Eco vs. 2012 Honda Accord EX-L, 2012 Hyundai Sonata SE, 2012 Kia Optima EX, 2012 Toyota Camry SE, 2012 Volkswagen Passat 2.5 SE". ^ "2013 Chevrolet Malibu 2.5 L". ^ "2014 Initial Quality Study (IQS) Ratings". ^ "Initial Quality Problems Increase as Automakers Struggle to Launch Vehicles with Technology That Consumers Find Easy to Use". ^ "2014 Chevrolet Malibu Spy Photos". Retrieved July 13, 2015. ^ "2013 Malibu". Media.gm.com. Retrieved August 4, 2012. 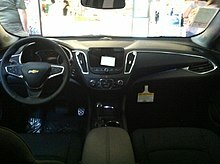 ^ "Chevrolet Malibu Diesel Confirmed for Europe, Hopeful for U.S." Autobytel.com. Retrieved August 4, 2012. ^ Migliore, Greg (April 1, 2015). "2016 Chevy Malibu gets premium looks, hybrid model". Autoblog. Retrieved August 6, 2016. ^ "2016 Chevrolet Malibu Specifications". Chevrolet Pressroom. Retrieved February 5, 2018. ^ a b de Paula, Matthew (April 30, 2015). "The High-Tech 2016 Chevy Malibu Is Significantly Better Than Before". Forbes. Retrieved March 11, 2016. ^ a b "2016 Malibu". Media.gm.com. December 15, 2014. Retrieved March 11, 2016. ^ "Service Insights pg23" (PDF). ^ a b U. S. Environmental Protection Agency and U.S. Department of Energy (May 6, 2016). "Compare Side-by-Side: 2016 Chevrolet Malibu Hybrid, 2016 Chevrolet Malibu 2.0 L Automatic (S8), and 2016 Chevrolet Malibu1.5 L, Automatic 6-spd". Fueleconomy.gov. Retrieved May 7, 2016. ^ "2019 Order Guide" (PDF). ^ "2019 Chevrolet Car Malibu" (PDF). 2019 Order Guide. ^ "2019 Malibu Midsize Car - Available in Hybrid". www.chevrolet.com. Retrieved October 21, 2018. ^ "GM's 'Industry Leading Truck Lineup' Sets Calendar Year Industry Sales Record" (Press release). January 3, 2002. Archived from the original on March 14, 2004. Retrieved February 5, 2018. ^ "mediaOnline". Media.gm.com. January 3, 2003. Archived from the original on March 27, 2008. Retrieved April 23, 2009. ^ "GM Reports December 2005 and Year Results". The Auto Channel. ^ "GM Media Online". Media.gm.com. January 3, 2007. Archived from the original on June 21, 2007. Retrieved April 23, 2009. ^ "GM Media Online". Media.gm.com. January 5, 2009. Archived from the original on February 21, 2009. Retrieved April 23, 2009. ^ "Deliveries December 2009". General Motors. Retrieved May 9, 2011. ^ "GM U.S. Deliveries for December 2010" (PDF). General Motors. Retrieved May 9, 2011. ^ "GM 2012 Sales: Chevrolet Silverado, Volt End Strong - GM Sells One Million 30-MPG Cars - Motor Trend WOT". Wot.motortrend.com. January 3, 2013. Retrieved October 29, 2013. ^ "GM U.S. Deliveries for December 2014" (PDF). General Motors. January 5, 2015. Retrieved January 13, 2015. ^ "GM U.S. Deliveries for December 2015" (PDF). General Motors. January 5, 2016. Retrieved February 9, 2016. ^ "GM U.S. Deliveries for December 2016" (PDF). General Motors. January 5, 2017. Retrieved February 5, 2018. ^ "GM U.S. Deliveries for December 2017" (PDF). General Motors. January 5, 2018. Retrieved February 5, 2018.